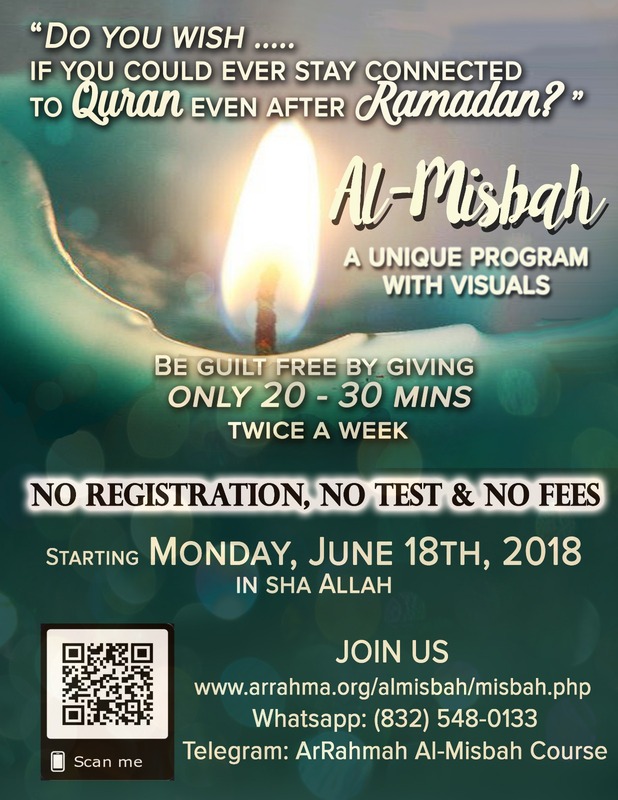 Share your reflections with us at "arrahmaclass@gmail.com"
Assalaamalaikum warahmatullahi wabarakatuhu ustaza I real have a very deep desire to meet you in person and thank you for all the khair that Arrahma is bringing in the lives of people who were having difficulties in getting engaged in Quran learning with families and work and other responsibilities of duniya Arrahma has made it so easy to learn at our own pace, time and in our own homes Alhumdulillah for making it so easy for us , I had this urge in me and was thinking it impossible but no more. I make dua for something and it is available in few days at Arrahma Alhumdulillah JazakAllah khairAn kaseeran for all you do. .
As salam walekum sister, I really want to say JazakAllah khair sis for delivering us such a beautiful informative course. Alhumdulilah ..I have been muslim since last 8 years and when i became muslim I started praying but slowly that khushoo started going away..I didn't know anything more than pray so i started comitting sins which now I am realizing astagfurAllah..I made so many duas to Allah to guide me as I felt helpless even though being in right path I was without any direction. When my sis inlaw sent me this course I wasnt expecting this life changing experience. .May Allah bless you sis..I am so Thankful to Allah to connect me to your course..With the first Surah Al Fatiha tafsir I felt tremendous wave of energy inside me sis..I felt I am having same khushoo when I prayed first time in my life SubhanAllah. Actually words nahi milrahe hai likhne ke liye itni cheezein hai likhne ke liye par samajh nahi araha isme se Kya likhu. Joining Al furqan course was the best thing happened to me in my life where I was struggling to get close to Allah swt by any means. I use to pray for guidance and Alhamdulillah through one of my friend I was introduced to this course. Whenever in my life I will go through something and need a solution I will pray to Allah swt I will get the answer through any of your lecture or through tazkeer Alhamdulillah. On day of lunar eclipse I came to know about nafeel namaz we have to offer but don't know anything about it what it is and how to perform and at same time I received your lecture this I think is not normal it means Allah loves me and answer my questions through you. Like this many situations if possible I would have written each and every experience of mine. My lifestyle my prayer my joy of giving has all increased after I joined this group Alhamdulillah. I joined this quran class in March 2007,and the changes which came in my life are amazingly positive.Two things which i learnt are 1.To love and fear Allah. 2.To love Quran.Now i feel quran is the best book in my life,i patiently wait for my class to see what next does Allah wants me to understand and implement in my life.Before i was not even covering my head because maybe i forgot i am a muslim.When back in India my brothers used to make me cover head but i used to do that out of fear of my brothers not Allah,then i came to USA in 2000,and then i felt that here nobody is watching me so i started wearing western outfits.Astaghfirulla.Then later on when there was this earthquake in Pakistan in Ramadan i thought that maybe Allah is angry with me and he is trying to teach me something so then i thought what life i am living is not according to what my Allah wants,then i decided i would take scarf.Then my non-muslim friends were shocked to see such a stylish girl taking scarf they opposed nobody appreciated me infact one of my friend always used to take the scarf off my head.Then later on i joined Arrahma class and the quran made me realise my shortcomings in my religion and i started taking scarf seriously and later on i started wearing Abaya Alhumdulillah.Not only this i learnt how to forgive people and now alhumdulillah my eyes are always on Akhirah and Paradise now even if i see someone's big house it does not even makes me feel that "oh such a big house i wish i had one" now when i see such houses it makes me think that what if i bought a house on mortgage specially now when i know that its Haraam in Islam.All thanks to Allah and Sister Najiha for making it so easy for me.The khushaal gharana tips which she gives brings me more close to my family and not only its limited to my notes i try to apply quran in my daily life also alhumdulillah.In the end i would say that people who are away from this should join because this would benefit them in the world and hereafter inshallah. Now with myself i am also learning how to save my Family from the hell-fire.May Allah save us all and Guide us till the end of our lives. It gives me immense pleasure to write about my Quran journey and my reflections about it. We humans are built with a nature that defies rules and craves freedom. Today, the social media is filled with slogans of living your life on your own terms, slogans like YOLO, you are in charge of your own happiness, and that friends and family don't matter if they don't give you the comfort you seek. We easily get carried away with the idea of this sort of life which is anything but fulfilling. Which is why today the world is inflicted with so many mental disorders and types all depression: all stemming from ignoring the need of the soul. My journey wasn't something I can ever take credit for. If I said I was brought down on my knees and pushed towards this path by Allah, I wouldn't be wrong. Something that should have been my life's path being born in a Muslim household wasn't my path. My mother worried for me. I wasn't wayward, but I wasn't a good Muslim either. Then life happened. And as with all life changing lessons, I experienced loss. Four times to be exact. When Allah decided that I will not have children, was the first time I realized everything is a grant from Allah: not something we can claim as our right. As would any spoilt-with-naimaah person, I sort of threw a tantrum. I went after every medicine, every treatment possible because I was so convinced it will happen. It did, four times, and each time the cause was as strange as the previous one. The last time it happened, the doctors beamed with joy, they were confident it was going to be a healthy baby, the reports were perfect; it was an "A grade" case according to their institution's internal assessments. But it all ended in the least expected way, my body let go of the life that could have been, and it let it go much earlier than expected. I fell in a rage and thought myself being denied something I was entitled to. "How could this be? Why me? Why only me? Why is it so easy for everyone and so physically and emotionally painful for me? What naiki did I leave out? I was so good (according to my silly measures). Why don't my 5 time prayers count? What about my fasts and zakaat? What about the time I was good to so and so person? What about ME?" This was probably the only time I think I crashed emotionally. I fell in despair, no direction in life, in utter disappointment thinking there was no life without a child. I was in a "zidd", I also knew that was wrong, but I was adamant. Then one day, my husband who was very concerned and hurt from the bitterness and aloofness building in me, left for work without saying Salaam. It was perhaps the first time it even happened in eight years and it was enough to rattle me. Who had I become? What did he do to deserve all this? What did any of my loved ones do to deserve the way I had begun treating them in my own bitterness? I spent that whole day analyzing myself. That day was the longest, most emotionally draining day of my life as I left aside all curtains I had pulled up to cover myself in my own eyes. I saw myself as who I had really become. And then, a realization struck me, hard and cold, and left me so ashamed that I avoided looking even at my reflection. It dawned on me, "was I striking a deal with Allah SWT? Did I think it was a two way road, me being good while He gives me what I desire in return? Was it all for a "matlab"? Did Allah need my goodness and my religious rituals to grant me what I wanted? Then, darker realizations hit me. Did I really think reading and memorizing every gynea detail off Google will make my knowledge complete? Can I ever know more than Allah? Can I predict the ways in which Allah can (or aauzobillah, should) respond?" I came to a conclusion that day: Allah had taken me on a ride to teach me the most important lesson of my life till then. He had shown me the mirror. He had shown me the weakness of my faith. I remember the time when losing my recent most pregnancy I had not said "inna lillah..." despite constant urges from my mother to do so. I was shamed beyond repair... and with a shameful heart, finally said what I should have said (had I really been of good faith) a long time ago: "inna lillahe waa inna elehe raajioon". In the days to come, I gathered courage to sit on my prayer mat and ask Allah to help me. I was so ashamed to know everything I had done and still be there asking for more. The words often evaded me and I just cried, knowing that Allah knows what is in the hearts. Then as courage slowly came back I started asking for direction. As I sat there day after day asking for direction, I didn't know if there was any for me. One might think me foolish for thinking like this, but that is what happens when you are depressed: your ability to think rationally slows down. I knew Allah will make a way for me even though I saw none. The answer came much earlier than I expected. A friend that I had met in sixth grade the last emailed me out of the blue. It was a link to a Quran course and what she wrote with it was strange. She wrote, "something in my heart tells me you will benefit from this". Let me make it clear she had no inkling of whatever was going on in my personal life. I stared at my phone screen reading that line over and over, feeling so many emotions at the same time. I knew the answer had come. I knew I had to take it. As with everyone who takes up the Quran, shytaan started distracting me with all sorts of pointless chores and hobbies. In the beginning, every week I would miss my lecture till the group leader who was assigned to us by ArRahma institute personally contacted me and would lovingly tell me how happy she would be if I would complete that week's lecture. The way she requested me was something I could not say "no" to. I felt obliged. This carried on till we reached the ayaat in Surah Baqarah about "munafiqeen" When the teacher explained to us about what Quran said about munafiqeen, it felt like someone gripped my heart, like I was caught red handed. It felt the whole earth was a little place, with no where to hide because I had been exposed in all my ugliness. My most private thoughts which I thought were private, were being narrated in front of me. It felt like Someone Powerful and Someone Worthy Of Absolute Judgement had stood me in front of Him and was charging me with everything I was guilty of. And the scariest part was, I WAS like that. I was guilty as charged. There was no chance of denying it. Someone had seen me through and again, the most frightening part was that The Someone had KNEW ALL ALONG. Thus started my new journey with Quran as I had realized that I was at a serious loss not being connected to it. The teacher made it so easy for us to understand it, may Allah reward her exceptionally, and tried to make us understand from a practical point of view. Since ArRahma's Ahsan-ul-Bayaan course is only for ladies, she makes it a point to talk about all of Quran's teachings from women's point of view. That makes it more relatable. I never had any foundation of understanding Arabic, except knowing how to read it. Since my classes have begun, I have been able to understand Arabic at a basic level. It is a source of immense joy for me to be able to receive this gift. My life has been completely turned around. I understand all the basic "why"s of my life. I understand how important is patience and being grateful. The Quran is "al furqaan" and it has enabled me to be bold enough to say right to what is right and wrong to what is wrong. It has given me the clarity I never had before. It is a pleasure I look forward to, week after week. It is a mandatory dose of peace, calmness and happiness that has become an integral part of my life. I have fallen in love with the voice of my teacher, Ustaza Najiha Hashmi, as I love the voice of my own mother. I feel the same tenderness ringing in it because that is the voice that teaches me Quran. Now I have started another course on the seerah of Prophet (peace be upon him) also. I am thankful to be guided the way I have been. I and thankful for every good or bad that happened to me, because it has brought me to where I am today. Alhumdullilah. May Allah bless everyone who works to seek Allah's pleasure at ArRahma, and especially Ustaza Najiha, my second mother. Ameen. Assalamlaikum, 6 months ago I started a new job in Sydney and I had to travel 3 hours daily in train. Some of my friend sent one of your tazkeer lesson on what’s app and I found it very useful for me. I google Arrahma and sent a message that I have travel time to learn Islam please send me some more of your lectures. Some kind sister start sending me regular almisbah lessons and hayate Tayyaba lessons on what’s app Now I have always. Something on my iPhone to listen during travel time with time flexibility I really enjoy your talks both Quran and seerat Specially seertat lecture I feel I am seeing all those makka and madina events in real life as I am there . I have never read seerat in this detailed manner . Your description is very thorough and clear. I am a consultant doctor in a hospital in Sydney and it is absolutely not possible for me to go and attend a religion lecture due to work and family commitments. But now I can learn about Quran and seerat well on my phone during travel I listen your lectures multiple times as more I listen more I find good rules for my life. I send them to my friends as well. You can not imagine how a voice from USA can be heard in Sydney in such a beautiful way straight entering into the heart. Jazakallah and thank you very much for spreading this beautiful message to all over the world.